I have been a New Life Spectrum fan for many years and the experiences I have had and seen with it are simply unprecedented. No other food can do what New Life Spectrum can do. However, I also know that sooner or later another brand is going to come along that is as good as or even better than New Life Spectrum, at least for certain situations. New Era may be one of those brands. It is a softer food and I think the texture alone can help some fish take to pellets better, especially saltwater fish. I don’t have nearly as much experience with it compared to New Life Spectrum, so it is hard to say how good it really is in comparison, but it certainly has the potential to be an exceptional food. The biggest difference is probably the moisture content. It is not nearly as dry as NLS and other foods. It is ‘moist’ in comparison. This means it is softer. They have a nice high algae formula that would probably be perfect for tangs and other algivores. They also have grazers which are little rings of food you mount to a suction cup (included) that allow fish to pick at it through the day. This reminds me of a food Sera has that sticks directly to the glass (although I think the New Era grazers are a much higher quality). I have been using it with my goldfish and they love it (as if they are hard to please). So far I have not had any buoyancy or other problems, but only time will tell. 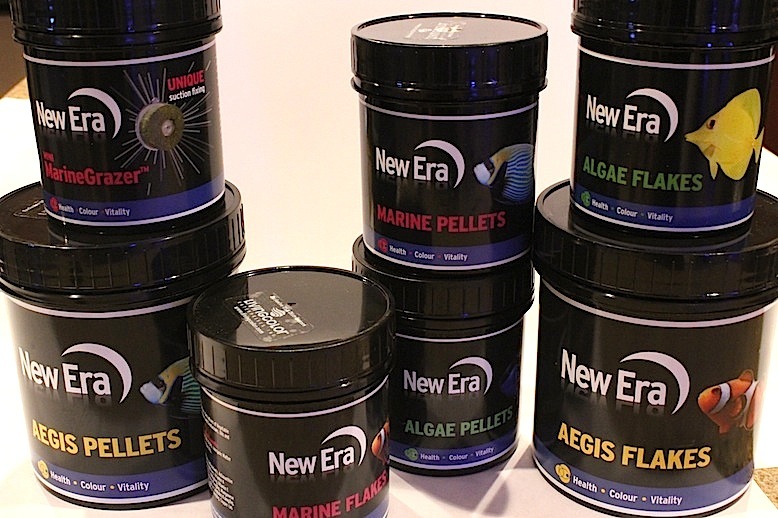 If you have some reason to not feed New Life Spectrum exclusively, definitely make New Era your next option.